Dhigali Maldives luxury resort provides a perfect adventurous escape on land, sea or underwater, where the thrill of discovery awaits. It is a truly subline experience with innovatively designed architecture, breath-taking sceneries & warm, intuitive service. The island of Dhigali is a 40-minute journey by seaplane from Malé Airport. It takes 1 hour and 10 minutes to get to the island from Ifuru/Dharavandhoo Airport, including a transfer by speedboat. Dhigali Maldives is a perfect blend of simplicity and luxurious comforts. 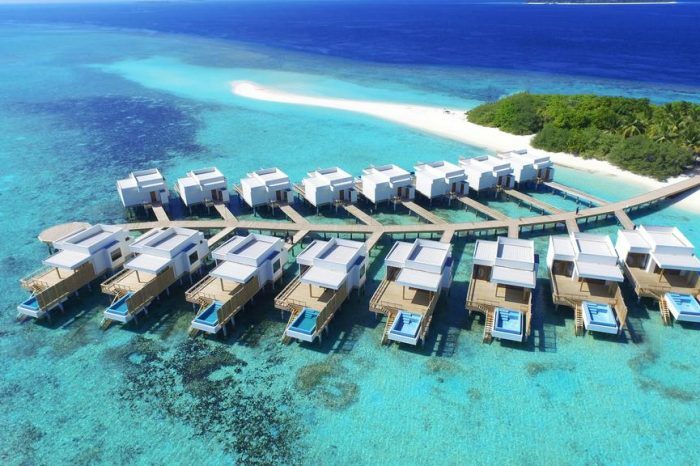 A wide range of villas and suites set between lush gardens and turquoise sea views at this Maldives beach resort provide absolute tranquillity. Dhigali Maldives feature many Maldives restaurants and bars providing local seafood, Maldivian spices, western favourites and divine signature Asian cuisine complemented with premium wine, beer and cocktails. All restaurants carry gorgeous views of the beach and island whilst ensuring diverse culinary experiences for guests. Haali Bar – “the place to be when the sun sets” it promote cocktails and sparkling drinks at the hippy bar. Faru (Grill Restaurant) – Situated on the beach. The continental menu consist of selection of meat and seafood, where the guests can select their cut, their choice of marinade and theit favourite cooking style. Battuta (Sinature Restaurant) – Located in the Jungles of the island, this restaurant is based on the travel of Ibn Battuta. Serving dishes that the traveller would have experienced in his journey across Asia. The Deli – Serving freshly made salads, sandwiches, smoothies, juices, coffee and Maldivian snacks. This has a grab and go concept, catering for those that are waiting for transfers or for those looking a quick snack in the middle of the day. Children’s menu available. Jade (Coffee Shop) – The snack haven on the resort. Serving comfort food for all taste. Capers – This is the main restaurant in the resort. The cuisine compromise both international and local delicacies. Dhigali Spa – Rustling palms + distant waves, this green retreat in the middle if the island invites deep relaxation. Daybeds + an outdoor pool, within 12 modern, minimalist treatment rooms, cocoon guests is absolute stillness. Water Sports – The big blue beckons + Dhigali provides myriad ways to explore it. Guests can also jump on a catamaran + go island hopping. There’s windsurfing, water skiing, wakeboarding, paddle boarding + kayaking. Sailing lessons + banana boat rides for the adventurous ones. Excursions – Dhigali has it all. Delicate flora, flourishing reefs, Maldivian culture + postcard panoramas. Experiences here are endless, from sunset + dolphin discovery tours to local island experiences that showcase the Maldivian way of life. Swimming Pools – Separate areas for adults + children give guests of all ages a space to enjoy. Children’s Club – Guests aged 3 to 12 years are invited into exciting activities + endless discoveries that let them learn + have fun at the same time. Indoor + outdoor fun is free at Dhigali Children’s Club.